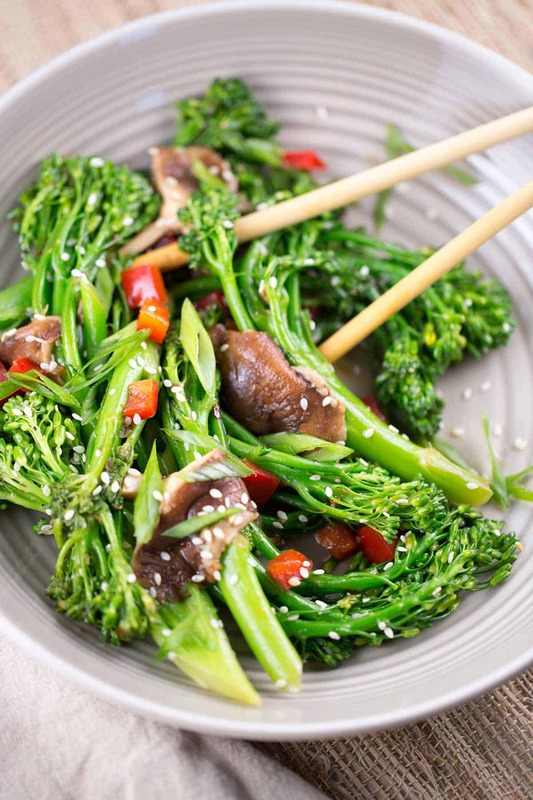 Stir-fry with broccolini and shiitake mushrooms is a fast and healthy side dish! Tossed in a spicy sesame chili soy sauce for a flavorful kick. Do you ever feel a little uninspired when cooking vegetables? You’re not alone. 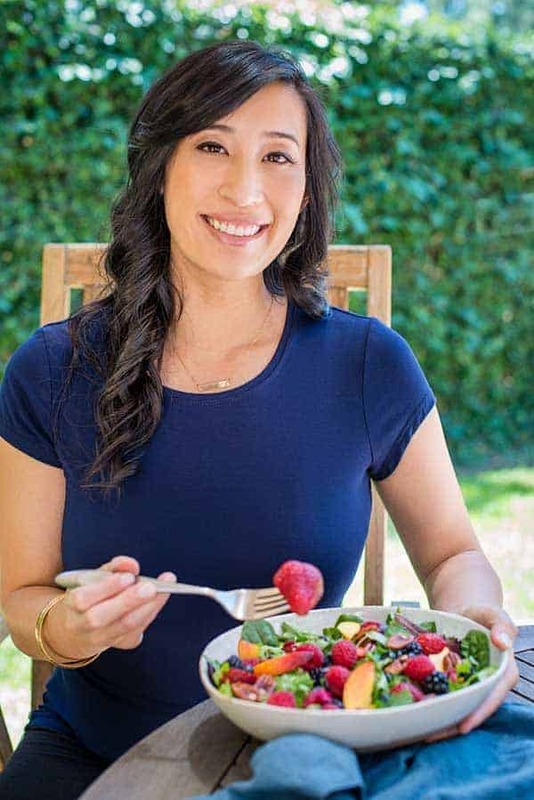 I’ve been looking for interesting ways to incorporate more flavor into healthy green ingredients. Sometimes I feel like when I’m selecting produce at the grocery store, I pick up a bunch of broccolini, and it’s staring at me saying “So, how are you gonna make them love me?” Geez, no pressure! This time I had just the right answer, stir-fried broccolini with shiitake mushrooms and a spicy sriracha sesame soy sauce, boom! If there was one irreplaceable tool in my family’s kitchen, it would be the wok. My mom would cook just about everything in it, from shrimp fried rice to steamed Chinese custard buns. It’s the one-pot-wonder that demands constant clanging and stirring, which make it a fun spectacle in the kitchen. The best part is the wok is heated so hot, that the vegetables and sauce cook fast, just don’t walk away too long, or your dishes could get overcooked! This beautiful bright green broccolini is a hybrid of broccoli and Chinese kale. The stalks are long and slender, with a slightly crunchy texture, a hint of pepper flavor with a touch of sweetness. I like these a little better compared to traditional broccoli because the crowns never get mushy if cooked too long. To make the greens a little more exciting, diced red bell peppers are added to enhance the pepper notes in the broccolini and give extra crunch. Have you ever noticed that mushrooms almost give a meaty texture and super savory flavor? 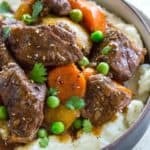 Yep, that’s exactly why there are added to this stir-fry so that if you’re not adding meat to this dish, you won’t be missing out too much. To make the broccolini shine, spicy red chili and soy-based sauce are stir-fried with the vegetables just at the end of cooking. 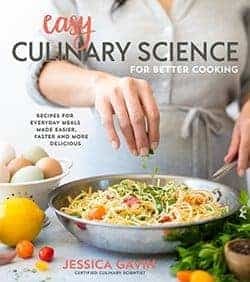 A mixture of fresh garlic, ginger, sesame oil, rice vinegar, Sriracha hot chili sauce , and red pepper flakes are infused together to give the vegetable dish a kick. The sauce isn’t unbearably hot, just a nice lingering heat. So add more or less of the chili sauce to what you can handle. What is the proper way to blanch broccolini? Blanching allows for tougher vegetables to cook very quickly in salted boiling water. This flavors the vegetables and makes them tender in a matter of minutes. To prevent overcooking, a large bowl filled with cold water and ice serves to halt the cooking process immediately. If you don’t do this, the broccolini may go from a beautiful bright green to a more olive green color and become overcooked. You only need to chill the broccolini for 5 minutes or until cool, then drain before the last stir-fry with the sauce. Combine all sauce ingredients in a small bowl, set aside. In a medium saucepan with salted boiling water, blanch the broccolini until bright green and tender, about 2 minutes. Drain, wash with cool water to stop the cooking process and set aside. Heat 1 tablespoon of vegetable oil over medium-high heat in a wok or large sauté pan. Add the mushrooms and sauté for 3 minutes or until tender. Add red bell pepper to the pan and sauté for 1 minute. Add the cooked broccolini, and cook for 1 minute. Reduce the heat to low and add the sauce, toss the vegetables and cook for 2 minutes. Season with salt and pepper as desired. Transfer vegetables to a dish. Pour some of the sauce over the top and garnish with green onions and toasted sesame seeds. I definitely shouldn’t have stumbled upon your blog when I was so hungry!! This looks amazing. Pinned immediately.